New York City is probably my favorite place in the world. I grew up outside the city in a small town in Connecticut, and love taking the train into New York to enjoy the hustle-and-bustle sights and sounds of a city that never sleeps. Recently, I met a friend of mine in New York City to walk around and make a stop to my new favorite restaurant in Little Italy. Hes not as into photography as I am so I opted for a smaller camera bag with less gear. I only took one body, one lens, a cell phone tripod, and 2 Platypod Pro portable tripods. With less gear, my bag was super-lightweight and it wasn’t bad carrying it around all day. We ended up covering a lot of groundWe arrived in Grand Central Terminal, then hiked up to Rockefeller Center before jumping into Central Park to explore the large reservoir. After some photos and a timelapse, we hopped on the subway and rushed downtown to World Trade Center and Battery Park just in time for sunset. Using everything I brought, I set up a timelapse of the new One World Trade Center building with my Nikon D7000, and then used my iPhone 6 Plus to shoot a timelapse of the sun setting across the Hudson River. Timelapsing takes time, and since youre waiting anyway its helpful to have multiple cameras to shoot different angles. I shot raw with the D7000, making it possible to pick a frame and process it, for the image below. 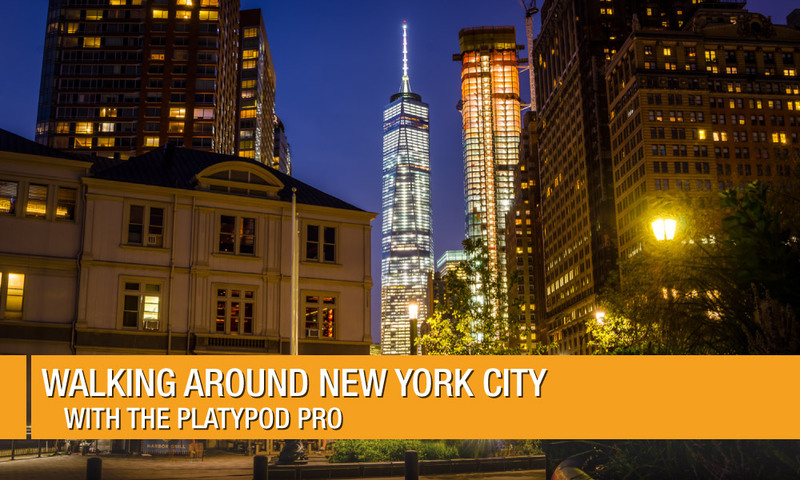 I was impressed with the Platypod Pro when I first saw it in Las Vegas. After shooting with it, I can see myself carrying at least one with me in my bag everywhere I go. Its so small and light, but stable enough to hold a DSLR with a zoom lens and keep it steady anywhere. The Platypod Pro comes in a cool little carrying case, but theres no need to carry two cases around. These are small enough that you can fit multiple Platypods in just one case. *Behind the scenes shot taken by Mike Lano.